Jupiter Mission - Solar System Planets And Moons Section. New Jupiter Mission Moves Forward. Galileo's image of Jupiter. Image credit: NASA/JPL. NASA announced today that it's pressing forward with a new mission to Jupiter called Juno, which will launch no later than 2010. This will be the second of NASA's New Frontiers Programs (the New Horizons Pluto mission will be the first). 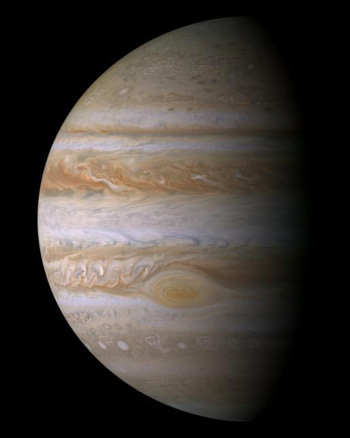 The $700 million spacecraft will travel to Jupiter, and then orbit the giant planet searching for an ice-rock core, determine the amounts of water and ammonia present in its atmosphere and study its winds and magnetic field. Dr. Scott Bolton of Southwest Research Institute, Boulder, Colo., is the principal investigator. NASA's Jet Propulsion Laboratory, Pasadena, Calif., will provide mission project management. Lockheed Martin Space Systems, Denver, will build the spacecraft.